OSV 40 was a vehicle study by Opel, with which the safety in passenger cars could be improved. The name OSV is a shortening of “Opel Security Vehicle”. Thought produced in 1974 it used the base of the Kadett C which became the Chevette in the UK in 1975. “ Silver Aero” is the Wayne Cherry Designed Sports Hatch Prototype that was exhibited at the 1980 NEC Motor Show. Click on the link on the left for further information. A Bedford Cavalier Mk1 Pick-up on the drawing board as a possible rival to the Ford P100. It didn’t make production but click on the lift to find out more information. A Bedford Cavalier Mk1 Van was also on the drawing board but like the Pick-Up never made production. Click on the left to find out more. Vauxhall’s Design department also proposed a Cavalier Mk1 Hatch Back. However it didn’t make it to production. Click on the link on the left for further information. Vauxhall’s Design Department also proposed a Cavalier Mk1 Estate. This didn’t make production, an Estate only coming with the Cavalier Mk2. Click on the link on left for more information. By 1977 Vauxhall needed to replace the Firenza in the Super Saloon Championship and Mega Bertha was to have been that car. The car was to have had either a 2.5 Turbocharged Opel engine or a 8.1 Litre Reynolds-Aluminium Chevrolet Unit. The car changed hands in 2017 and has been built and made its debut at Goodwood 2018. Click on the link on the left to find out more. A Prototype of the Opel Ascona C (Cavalier Mk2) Convertible was displayed at IAA Franfurt in 1981. Click on the link for more information. Robert Jankel Design study for a Cavalier Mk2. Click on the link on the left to find out more. The Vauxhall Design Department had a Styling proposal for the Cavalier Mk2 as well as the car we know today which was the Opel Proposal. The Vauxhall proposal had a Carlton Mk1 looking nose. Click on the left hand link to find out more. A Cavalier Mk3 Estate was announced at launch of the Cavalier Mk3 and dealers were saying to prospective customers that the car was coming. It never arrived. Click on the link on the left to find out why. This was Vauxhall’s proposal for a Group A Rally Car. A prototype was built and tested but the car never raced and Vauxhall went Touring Car Racing instead. Click on the link to find out more. Based on the floor plan of the Cavalier the TRAKA is a Concept that could have rivalled the Suzuki SJ 4x4. Click on the link to find out more. In South America around 1982 there was a Chevrolet Monza (Cavalier Mk2) 2-Door Estate, displayed. The car was however never produced. Click on the link on the left to find out more. This Town Coupe by Electrification of Maldon, Essex was displayed at the 1976 Motor Show. It bears a resemblance to the Chevette and although not an Official Vauxhall proto-type they did contribute running gear. Click on the left hand link for more information. The Opel GT2 was a design concept based on the Opel Manta/Ascona B in 1975. Click on the link on the left for more information. Vauxhall’s Styling Department had proposal’s for a Chevette Coupe and Targa. Prototypes were built but neither entered production. Click on the link to find out more. Some of the the concepts for the Chevette by Vauxhall’s Design Department. Click on the left had link to find out more. “Black Magic” was like “Silver Aero” was another Wayne Cherry Designed Prototype. The car was Wayne Cherry’s personal transport for a period of time. Click on the link on the left to find out more. 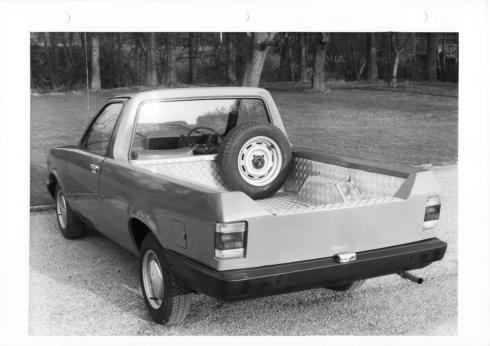 There was a proposal for a Bedford Chevanne Pick-Up again Designed by Vauxhall’s Styling Department. It didn’t make production in the UK but did end up as a Saehan (Daewoo) in South Korea. Click on the link to find out more. Early Styling Concept for the Vauxhall Calibra. Click on the link on the left to find out more. Vauxhall proposed to use the Calibra as a Rally car at one time. It should have been a success, it was not. Click on the left hand link to find out why it was not. Various design studys for the Opel Kadett for 1978. Click on the left had link to find out more. 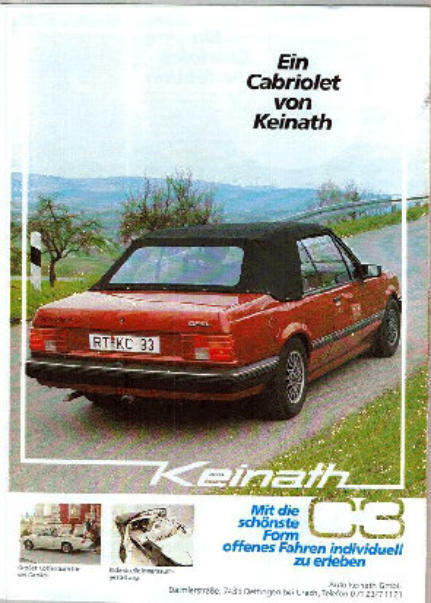 Keniath in Germany produced a number of different models for Opel during the 1980’s. The C3 being a Convertible based on the Ascona C (Cavalier Mk2). Never officially sold in the UK. Click on the link on the left to find out more. In 1987 Irmscher showed a Concept Study based on the Opel Manta at IAA Frankfurt in 1987. Click on the link on the left to find out more.